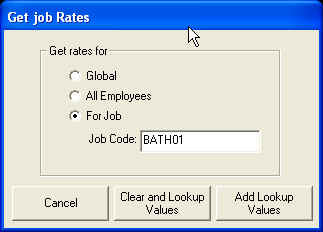 Here we are going to get Time Rates for Job "BATH01". We then press [Clear and Lookup Values] or [Add Lookup Values] button to populate the spreadsheet with data Exchequer Enterprise Job Costing Time Rate records. Job Time Rates may not update properly due to bugs in COM Toolkit. Also once imported Currency codes cannot be changed and some times the COM toolkit gives error "Update not possible as original version of record not found".